Let’s keep getting to know the SageGlass team! 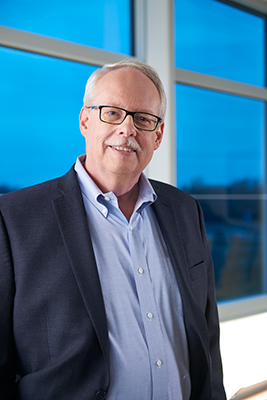 Lou Podbelski serves as Vice President of Architectural Solutions (AS) at SageGlass and works with a variety of customers, ranging from architects and building owners to glazing contractors. Q: What is your typical day like at SageGlass? There is really no typical day, which is what makes my job interesting. My day can be anything from interfacing with sales people to helping solve customers’ questions about integrating SageGlass into a building design to assisting customers directly to coaching the members of my team. We care a lot about our people at SageGlass, so part of my time is spent looking at how they are doing and how we, as a company, are helping them to develop. Do they understand the overall mission of the company? Do they know all that they need to about the product and our industry? How can I help them excel in their jobs? We’re growing, so interviewing and evaluating people is an important aspect of what I do. We are very diligent about making sure we have the right people and determining how they will fit in with what is needed for the position, including the technical and the customer service aspects. A potential Architectural Solutions team member needs to strike the correct balance. Q: What is the most challenging situation you’ve overcome with a customer? On the pre-sales side we still hear “it’s too expensive.” Customers have a tendency to want to compare our dynamic glass to regular non-switching glass, but our product offers so much more! My job is to peel back the onion and show potential customers all that our dynamic glass can do. With SageGlass, you won’t need blinds or shades on the interior or sunshades on the exterior, plus it will help you save energy. We also focus on the positive impact our product has on occupant comfort; if you have people who are happy, they are more productive, and there are financial advantages to having more productive and comfortable people. Q: How would you describe SageGlass’ company culture? There’s a tremendous amount of camaraderie, not just at the senior leadership level; it exists there, but also within the groups. In the Architectural Solutions group, you can see this camaraderie exhibited every day. Someone on our team quickly recognizes when someone else needs help and will jump right in! This is really gratifying to see and makes for a better workplace! Our team wants to volunteer and to help their team members out – which in the end is a win for our customers, too. Q: Is there anything else about SageGlass that you just can’t keep to yourself? The product itself and the lengths we will go to for a positive customer experience are both unique in our industry. Everyone here understands what we’re trying to do, and we are transparent in many respects about the product, its benefits and what our company goals are. We try our absolute best to communicate in many different ways, verbally, in writing and at all-company meetings called “One Meetings.” I’ve never seen such transparent communication as we have here, and I’ve been in this industry for over 25 years. It’s important because you really want people pulling together and not wondering where we are going as a company and what exactly they are contributing to this mission; it’s well mapped out. Stay tuned for our next Sage Advice Q & A!